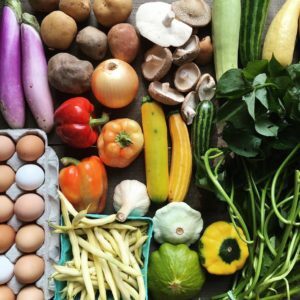 For those new to the concept, Community Supported Agriculture (CSA) is a way for farmers to smooth out the risks of farming by selling shares of the year’s harvest before the first seed is planted. Shareholders agree to take what the farmer provides and the farmer agrees to supply them with the best of what the farm produces each week. The farmer’s advantage is in deciding what goes into a share and being paid up front. The shareholder’s advantage is in getting fresh produce significantly cheaper than our market prices while experiencing a wide variety of foods that they otherwise might not have tried. The pictures at the top of this page are of shares from 3 different weeks of the 2016 season. 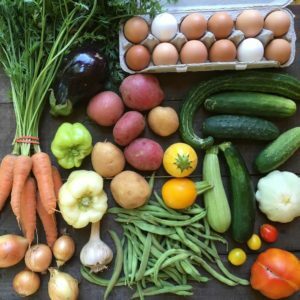 The 2018 CSA runs from May 16th to October 24th. Members will receive 23 total baskets of food. Beginning the CSA mid-May means we will kick things off with fresh strawberries. Expect salad mixes, dark greens and fast-growing root crops like radishes and salad turnips. May brings the season’s first shiitake as well. Shortly after that, the cucumbers and squash will be in full production and potatoes will be ready to dig. We will continue to harvest a wide range of greens, but tomatoes and squash are summer’s big producers and we plant lots of tasty varieties. Expect peppers and an occasional jar of honey during summer. Greens return in force toward late summer and tomatoes and squash continue. Fall root crops like turnips begin to mature, along with sweet potatoes and fall brassicas. The season will wrap up with cold-weather greens, a variety of winter squash and several canned goods. We include the above section on what to expect during the growing season to give you an idea of the flow of the CSA. It is not even close to a complete list of the foods you will receive, but it is a helpful outline. 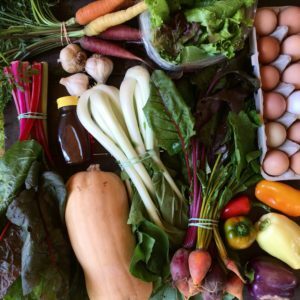 If you are interested in a Starstead CSA share for 2018, use the contact form on this website and we will send along more information.